In the shadow of the Himalayas and known as the ‘Roof of the World’ due to its breathtaking average height of 13,200ft (4,060m) above sea level, Tibet is home to more Himalayan peaks than anywhere else. Mount Everest lies on its border with Nepal. 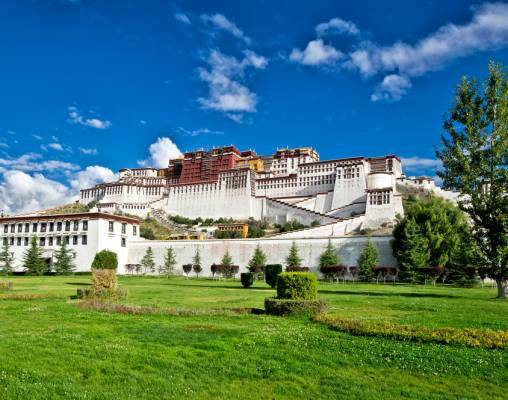 As befits such a remarkable land, Lhasa is home to an amazing UNESCO collection of spectacular palaces and temples. Yet, Tibet has been virtually inaccessible by land. That changed with the building of the Golmud to Lhasa railway. More than 600 miles (965kms) is at an altitude of over 13,000ft (4,000m) and much of this magnificent line runs over permafrost. With the summit, the Tangula Pass, at 16,640ft (5,072m) it is also the world’s highest railway. To travel on this line is a true pioneering adventure, an experience as unique as the destination itself. Today we visit the renowned Provincial Museum in Urumqi, famous for having the artifacts and mummies of Caucasians who lived in the region between 1,500 and 4,000 years ago; There is also a fine collection of silk articles and other artifacts from various eras of history, as well as written materials in different languages. What most people come to see are the mummies and their artifacts, and they are unusually well preserved. Until two decades ago, this culture was hardly known to historians and archaeologists, and their history and origins remain much of a mystery. The Xinjiang Autonomous Regional Museum houses the mummies and their artifacts that are some of the most significant archaeological discoveries in a hundred years, and it is an excellent place to learn the history of this region. Today we will visit the Old City of Kashgar, with a history of more than 2,000 years. Uygur people have lived here for generations carving out a splendid society in the process. Kashgar old city was the renowned center at the crossroads of the Southern and Middle Silk Roads in the past. Today, Kashgar Old City is still a cradle of culture, a burning torch to the memories of the past and is, without doubt, a step-back into the past in which you are a living part. Tonight, we stay for one night at the five-star Radisson Blu Hotel Kashgar. 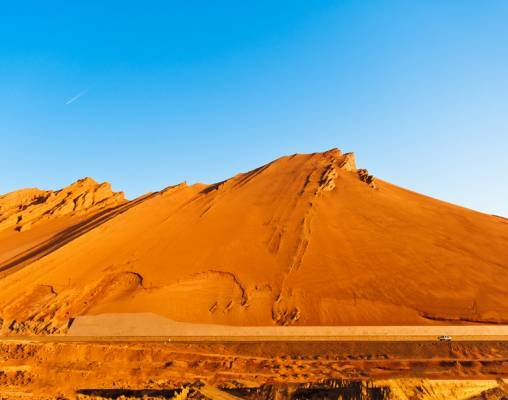 Turpan is the location where the Flaming Mountains create a magnificent backdrop. First, we visit Jiaohe Ancient City which is one of the best preserved ancient cities in China, the ruins of the buildings are divided into temples, civilian dwellings and government offices, workshops and residential houses in the streets are still visible, and time there is time spent in a world long disappeared. In the afternoon, we take a fascinating tour to the world-famous ancient underground irrigation system at Karez that has successfully fed the rich orchards and vineyards for centuries; The system is considered as one of the three great projects in China with the other two being the Great Wall and the Grand Canal. In the small oasis city of Dunhuang, we will visit the fascination Magao Thousand Buddha Cave Complex. This impressive site contains almost 500 grottoes, carved between 700 and 1,700 years ago. Inside we will see an amazing collection of beautiful sculptures and murals depicting the evolution of Buddhist religious art over 1,000 years. Today in Jiayugaun we visit the first pass at the west end of the Great Wall of China, the Jiayuguan Pass. Along with Shanhaiguan, it is one of the largest and most intact passes of the Great Wall. 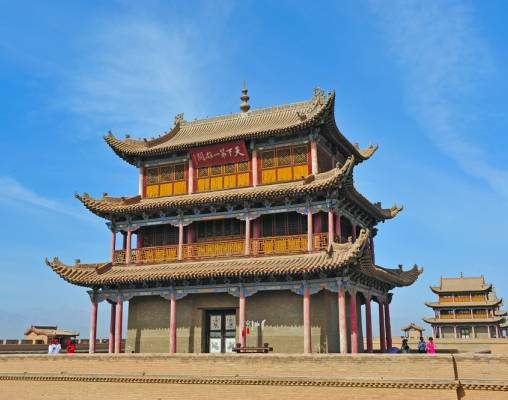 It was an important military fortress and also a vital traffic fort along the Silk Road, the world's oldest trading route, connecting China, Central Asia, and Europe. Standing in the endless desert with rolling mountains as its backdrop, this isolated pass will take you back to the desolation and loneliness of frontier life in ancient times. After lunch, we head for the Overhanging Great Wall, which was constructed in the year of 1539 during the Ming Dynasty (1368-1644). The wall was built in order to support the already existing Jiayuguan Fort which held a key role in the defense mechanism of the area around Jiayuguan. Parts of the wall are steep so for those who do make it to the top will enjoy a bird’s eye view of endless Gobi Desert, a couple of oases and snow-capped mountains seen from a great distance. We set out from our train this morning stopping first at the Buddhist Kumbum (Ta’er) Monastery. Kumbum was founded in 1583 in a narrow valley close to the village of Lusar in the Tibetan cultural region of Amdo. In the afternoon we will visit the Shuijingxiang Market. At the entrance of two intersecting alleys, each more than 1,100 meters long are more than 3,000 fixed stalls. The market has everything from food and drink to articles for daily use. You can not only find lotus roots and wild rice stems, which are products of Southern China but also seafood from the coast. Guests are met upon arrival in Lhasa and are transferred to the centrally located luxurious five-star The St Regis Lhasa Resort for a three-night stay.Located in the eastern part of Lhasa, The St. Regis Lhasa Resort is this unique city’s most coveted address conveniently located in the famed Barkhor area. The sweeping landscapes surrounding this exclusive resort provide a timeless, inviting setting for contemplation as well as exploration. The St. Regis Lhasa Resort faces the World Heritage Site, the Potala Palace, once the chief residence of the Dalai Lama. A mere six minutes by car from the resort, the palace has been converted into a museum. Jokhang Temple, another iconic structure, and Norbulingka, the Dalai Lama’s former Summer Palace, are also close by. Lhasa is located in a small basin surrounded by mountains, and it literally means "place of the gods." 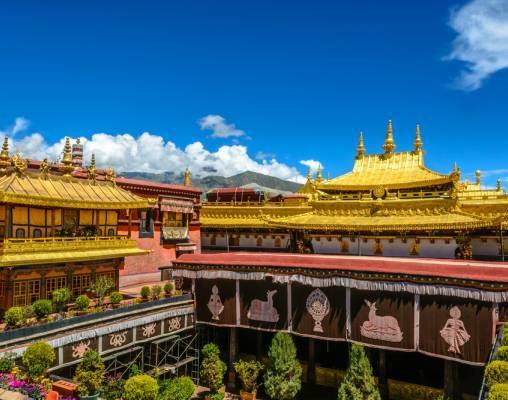 At an altitude of around 11,975ft (3,650m), it is one of the highest cities in the world; it is also the traditional seat of the Dalai Lama and the holiest center of Tibet with over a thousand years of cultural and spiritual history. 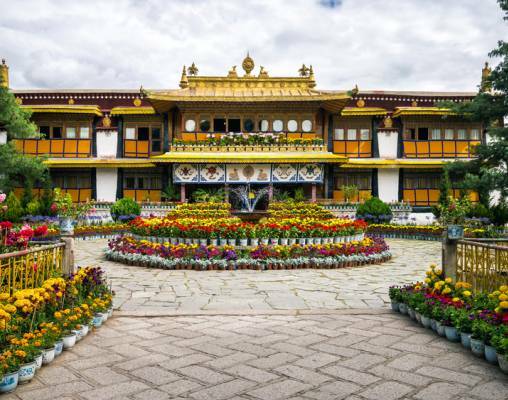 Today we visit Norbulingka, the Dalai Lama’s Summer Palace, it was built in the 1740’s as a retreat from which to escape the heat of the summer. Meaning either ‘jewel garden’ or ‘precious garden,’ it is still a tranquil haven from the noise of the city and a wonderful place to explore. 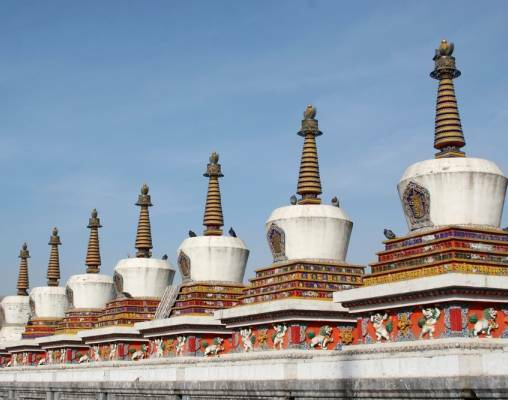 There will also be free time to wander through Lhasa and soak up the atmosphere of this picturesque city. On our second full day here, we visit the 13th century Jokhang Temple, Tibet’s holiest shrine and the spiritual home for almost all Tibetans. Next, we explore the adjacent Barkhor market, the oldest market in the capital and a well-trodden route for the many pilgrims who make their way to the temple. A local lunch is accompanied by traditional folk music. This afternoon we visit the 17th century Potala Palace, former seat of the Tibetan Government and the Dalai Lama’s winter residence before he fled to India in 1959. It contains thousands of rooms, dominates the city skyline. Perched upon Marpo Ri hill, 130 meters above the Lhasa valley, the Potala Palace rises a further 170 meters, is the greatest monumental structure in Tibet and one of the architectural wonders of the world. Enter your details below if you would like to be notified when 2020 dates and prices are available for The Golden Eagle - China & Tibet Rail Discovery.